Paleontologists have discovered a new species of dinosaur with a softball-sized lump of solid bone on top of its skull, according to a paper published in the April issue of the journal Cretaceous Research. 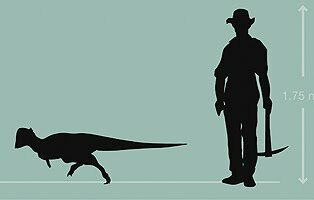 The species was a plant-eating dinosaur about as big as a medium-sized dog that lived 70 to 80 million years ago, said Nicholas Longrich of Yale University, lead author of the paper. The team discovered two skull fragments in Big Bend National Park in southwest Texas in 2008. They compared them to dozens of fossils from related species found in Canada and Montana before confirming that the fossils represented a new genus of pachycephalosaur, a group of bipedal, thick-skulled dinosaurs. The researchers named the new species Texacephale langstoni. (“Texacephale” means “Texas head” and “langstoni” is in honor of Wann Langston, a fellow paleontologist.) The new species is one of about a dozen known to have solid lumps of bone on top of their skulls, which Longrich speculates was probably used to ram one another head-on in a manner similar to modern-day musk oxen and cape buffalo. The discovery of the new species lends further weight to the idea, which has gained popularity in recent years, that dinosaurs found in Canada and the northern United States were distinct from their southern neighbors. Because fossils from the Big Bend region are rare and tend to be poorly preserved, scientists do not have a complete picture of the different species that once inhabited the area, Longrich said. But the team may have uncovered an important piece of the puzzle with their discovery. They found that this particular group of dinosaurs, which was previously thought to have originated in Asia, likely evolved in North America. Longrich expects more related species to be discovered in the future as fossils from the Texas site and elsewhere continue to be examined. “I think we underestimate how many different species there were,” he says. Other authors of the paper include Julia Sankey (California State University, Stanislaus), who led the fieldwork, and Darren Tanke (Royal Tyrrell Museum), who discovered the more complete specimen on which the naming of the new species was based.